No composer was ever so in love with a metropolis as Francis Poulenc was with Paris. This ultra-sophisticate, easily bored and depressed, detested the inevitable exile from his beloved home town during concert tours in the French regions. 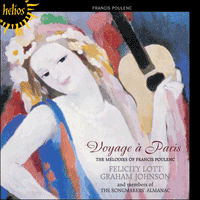 At the end of these provincial recitals, Voyage à Paris was performed as a rather malicious encore: it is an unashamed paean of joy (and relief) at the prospect of re-entering the urban melting-pot. Poulenc wrote in his Journal de mes mélodies: ‘To any who know me it will seem quite natural that I should open my mouth like a carp to snap up the deliciously stupid lines of Voyage à Paris.’ As a teenager Poulenc had only slightly known the poet Guillaume Apollinaire (1880–1918), but even on hearing Apollinaire read his poems aloud, the young composer recognized a kindred spirit. Apollinaire was Polish–Italian by birth (Kostrowitsky was his real name) but his love for Paris had all the intensity of the convert. Montparnasse is a beguiling and nostalgic evocation of south Paris and its magic as felt by the wide-eyed and inexperienced apprentice poet. It took Poulenc some four years to piece together his setting of these words, but the seamless unfolding of the music as it follows the affectionate meanderings of the poem is a triumph: he finds tune and harmony to suggest not only the longing for vanished times of the poet’s youth in Montparnasse, but also Apollinaire’s rueful smile at his gauche, younger self—un peu bête et trop blond. Hyde Park transfers the scene to London. It makes these twinned pieces a type of ‘Tale of Two Cities’ in song, although, as far as Hyde Park is concerned, Poulenc knew he had done far, far better things. ‘It is nothing more than a trampoline song’, he wrote, meaning that he intended it to be a quick, effective springboard into a more substantial mélodie. The vignette marked follement vite et furtif depicts the crazy preachers of Hyde Park Corner, reproving nannies airing their charges, and the pea souper fog preventing policemen from seeing enough to press theirs. Red cyclops’ eyes in the mist are nothing more mythological then the glowing of tobacco pipes. Racy humour in both Poulenc and Apollinaire is always capable of suddenly yielding to the deepest emotion. The word ‘bleu’ is slang for a young soldier, and the title of the song Bleuet (which literally means ‘cornflower’) is a tender diminutive. The boy soldier is about to die; five o’clock is the time to leave the trenches and face the enemy fire. But there is no exaggerated heroism or patriotism in this song. Poulenc wrote: ‘Humility, whether it concerns prayer or the sacrifice of a life is what touches me most … the soul flies away after a long, last look at “la douceur d’autrefois”.’ It is Poulenc’s only mélodie for tenor, and the voice needs to be that of a Cuenod rather than a Gigli; in describing the young man of twenty, the sad waste of his life, and that long last look, the narrator’s voice should have a special and ethereal timbre. Apollinaire wrote the poem in 1917, a year or so before he himself died as a long-term result of his war wounds. Voyage is also a moving valediction, and its words too are set in a wartime context. Who but Poulenc could have deciphered this Calligramme (Apollinaire’s name for his experiments in pictorial typography—and this one is especially puzzling in lay-out) and produced a song of such flowing lucidity? There is an atmosphere here of resigned acceptance—partings in war are often permanent farewells; the journey of Dante through the infernal realms knows no return. As in Montparnasse we are aware of an almost chemical reaction which takes place when Poulenc’s music meets the so-called surrealist poetry of Apollinaire and of Paul Éluard (1895–1952). Poulenc wrote: ‘If on my tomb were inscribed: here lies Francis Poulenc, the musician of Apollinaire and Éluard, I would consider this to be my finest title to fame.’ With his innate understanding of their work, the composer illuminates the sometimes inscrutable poetry which in turn, through its force and dignity, ensures that his lyricism never topples into sentimentality. It is as if a wonderful bargain has been struck between head and heart, between modern use of language and the old-fashioned power of melody. Hôtel takes us back to Apollinaire’s Montparnasse, and Poulenc’s. Just after the First World War the area was the home of Picasso and Derain, of Gris and Modigliani. The composer, a connoisseur and lover of painting all his life, was excited by the avant-garde buzz of the Montparnasse of his youth. But Hôtel is not about creativity. Quite the reverse. It is about laziness. And here too, according to his friends, Poulenc was quite an authority! The opening chord suggests the first deliciously long exhalation of a Gitane’s dangerous delights. The music yawns and stretches and the smoke spirals to the ceiling in the rhythm of a very slow waltz. The Apollinaire section of this recital ends with the earliest Poulenc mélodies on this disc, the Trois Poèmes de Louise Lalanne. Apollinaire chose this name in order to masquerade as a female poet in the pages of the literary review Marges. Montparnasse laziness got the better of him however, and he rifled through the literary jottings of his mistress in order to find something suitably feminine to meet his publishing deadline. Apollinaire’s loving collaborator was none other than the painter Marie Laurencin (1885–1956; a painting by her is on the cover of this booklet) who designed the costumes and sets for Poulenc’s first great success, the ballet Les Biches, presented by Diaghilev in 1924. Laurencin had been enthusiastically ‘discovered’ by Apollinaire in his role as influential art critic. In this song-set only the whirlwind nonsense of Chanson is by him. Le présent (where Poulenc is influenced by the implacable last movement of Chopin’s B flat minor Sonata) and Hier are Laurencin’s words. Hier is the first of Poulenc’s mélodies to employ the lyrical vein in which so many of his best songs were to be written. By 1931 when it was composed, Poulenc’s roaring twenties were behind him. The clown and ragamuffin shows in this song that he is capable of melancholy things, and he chooses the style of a smoke-filled room of a Paris boîte (the ghost of Piaf’s predecessor, Marie Dubas, hovers) to make his tender revelation. If the Apollinaire songs are of earth and water (the feel of the Paris pavement, the sound of the Seine), the Paul Éluard songs are made of fire and air. Indeed it must be admitted that the greatest Apollinaire settings were written only after Poulenc had passed through the refining fire of contact with Éluard’s poetry. 1936 was a pivotal year: one of Poulenc’s friends, the composer Pierre-Octave Ferroud, was killed in a macabre accident; Poulenc was reconverted to catholicism as a result of a mystical experience at the shrine of the Black Virgin of Rocamadour; his song duo with the baritone Pierre Bernac was firmly established; and Éluard became a cherished collaborator in his vocal music. Out of these experiences a more serious and dedicated creator emerged, and in Bernac he had found a serious and dedicated interpreter to give voice to this new idealistic lyricism. From this time, the cycle Tel jour telle nuit is one of Poulenc’s greatest achievements. Undeterred by superficial difficulties, the composer goes to the heart of Éluard’s texts. The poet’s own experiences (journeys, encounters, friendships, dreams, and above all his love for his wife Nusch) have gone into the making of the poems. Poulenc’s musical interpretation helps to unlock a door: behind it Éluard, the seemingly formidable intellectual, is revealed for what he really was—a poet of the people who sang unstintingly of love, the beauties of nature and the brotherhood of man. The last mélodie in this cycle, Nous avons fait la nuit, is one of the greatest love songs in French music; the poem is but one man’s explication of a relationship, yet, illuminated by Poulenc’s music, it takes on a universal significance and shows a deep understanding of the nature of love itself, and the means of its constant renewal. It is no surprise that the song’s postlude, which is the summing up of the cycle, has a power that recalls the end of a less optimistic but similarly heartfelt cycle, Schumann’s Dichterliebe. The three short songs that make up Vilmorin’s Métamorphoses are quintessential Poulenc, and indeed make up a sampler and mini-compendium of his three basic song styles: fast and capriciously lyrical (Reine des mouettes), slow (never very slow) and touchingly lyrical (C’est ainsi que tu es) and fast in the café-concert tradition, where moto perpetuo virtuosity is the thing (Paganini). That these enchanting feather-light songs stand chronologically close to Tel jour telle nuit shows the discerning versatility of Poulenc’s song-writing in the late 1930s. Colloque, with a text by Paul Valéry (1871–1945), was unpublished until after Poulenc’s death. True to its title it is a colloquy in which the two voices never sing together. Valéry’s original title for the poem (dedicated to Poulenc) was ‘Dialogues pour deux flûtes’. The composer admitted that although he admired Valéry as much as Verlaine or Rimbaud, he was not comfortable in setting his words. The vocal line and harmonies are graceful enough, but there is no real fusion between words and music. The Deux Poèmes de Louis Aragon by contrast are perfect Poulenc. In C, Louis Aragon (1897–1982) sees the fall of France into German hands in 1940 as the sorry outcome of centuries of false values and a patriotism that had been based on class exploitation. On paper the words can seem bitter and angry, but Poulenc finds the heartbreak in them: Marxist poet and château-dwelling composer (Poulenc owned a beautiful country house at Noizay near Tours) are united in song by a common French birthright. Fêtes galantes is an antidote to too much nationalistic self-pity. The nation that produced the coolly elegant courtiers of Watteau’s ‘Fêtes galantes’ in the reign of Louis XV, now finds itself in complete disarray with the onslaught of the Nazi invaders. There is not much elegance left in the French comedy of manners, but even if manners are thrown out of the window, comedy remains. Life under the occupation changed many things, but the institution of the cabaret song, sung at full tilt, vulgar and poetic at the same time, could never be anything but defiantly, irrepressibly French. Priez pour paix was written in the dark days of the Munich crisis. The words are by Charles, duc d’Orléans (1394–1465). Poulenc wrote: ‘I tried to give here a feeling of fervour and above all of humility (for me the most beautiful quality of prayer). It is a prayer for a country church.’ This is not only religious music; in a subtle way it strives to achieve a medieval hieratic atmosphere appropriate to the poet. In 1935 Poulenc re-worked the music of the sixteenth-century composer Claude Gervais into his Suite française (both a chamber work and a piano suite). À sa guitare, also from this period, shows the hand of the tasteful pasticheur. All this music was, in fact, written for Margot, a play by Édouard Bourdet about Marguerite de Valois, although Poulenc chose to set lines by Pierre de Ronsard (1524–1585). It was first sung by the famous singing actress Yvonne Printemps. The orchestration of the song, as heard on Printemps’ famous recording of it, has since been lost. The last three songs on this disc show a lighter side of the composer. Toréador (words by Jean Cocteau, 1889–1963) is the only song that contemporaries agreed the vocally ungifted Poulenc sang better (and more nasally) than anyone else. It is a farrago of Hispanic-Venetian nonsense which powerfully evokes the music-hall. It is the kind of uproarious music that the teenage Poulenc (inspired by Maurice Chevalier) could improvise by the metre; he was to transform such raw material into more subtle evocation in the songs of his maturity. Nous voulons une petite sœur is a patter song of small musical substance, but immense charm. She who can survive the pronunciation hurdles of Madame Eustache’s Christmas list deserves a diction prize and a rest from the demands of importunate children.Les chemins de l’amour is another Yvonne Printemps song, this time written for Léocadia by Jean Anouilh (1910–1987). It gives us a glimpse of how easily Poulenc could have written ‘hits’ of the time, or film music like his colleague Georges Auric. This waltz is much sung in recitals these days and over-used as an applause-earning encore. After all, España is not the best of Chabrier, nor Boléro the best of Ravel, though both are masterpieces in their way. Poulenc would have regarded this charming trifle as a petit-four to be presented only after a substantial serving of his great mélodies. But as all gourmets and song enthusiasts know, an excellent petit-four is irresistible at the right time. Jamais un compositeur n’adora une métropole autant que Poulenc adora Paris. Cet être ultraraffiné, volontiers enclin à l’ennui et à la dépression, détestait l’inévitable exil que lui imposaient les tournées de concerts en province, loin de sa chère ville natale. Dithyrambe éhonté disant toute sa joie (et son soulagement) à l’idée de retrouver le melting-pot urbain, Voyage à Paris venait clore ces récitals en un bis un brin malicieux. «Quand on me connaît, il paraîtra tout naturel que j’aie ouvert une bouche de carpe pour happer les vers délicieusement stupides du Voyage à Paris», écrivit Poulenc dans son Journal de mes mélodies. Adolescent, il avait très peu connu Guillaume Apollinaire (1880–1918) mais l’écouter lire à voix haute ses poèmes lui avait fait reconnaître une âme sœur. Apollinaire (Kostrowitsky de son vrai nom) était italo-polonais de naissance et son amour de Paris avait toute l’intensité d’un amour de converti. Montparnasse est une séduisante évocation nostalgique du sud parisien dont l’apprenti-poète ressent, les yeux écarquillés, toute la magie. Poulenc mit quatre ans à assembler cette pièce, mais le déroulé coulant de la musique, épousant les tendres méandres du poème, est un triomphe: il a trouvé la mélodie et l’harmonie à même de suggérer et la nostalgie des temps révolus de la jeunesse du poète à Montparnasse et le sourire chagrin de ce dernier face au jeune homme gauche qu’il était alors—un peu bête et trop blond. Hyde Park nous transporte à Londres et forme, avec sa jumelle parisienne, un genre de «Conte des deux villes» en chanson même si, la concernant, Poulenc savait avoir fait beaucoup, beaucoup mieux. «C’est une mélodie tremplin, rien de plus», écrivit-il, signifiant par là qu’il la voulait comme un tremplin rapide et efficace vers une mélodie davantage substantielle. La vignette marquée follement vif et furtif évoque les drôles de prêcheurs de Hyde Park Corner, les nurses réprobatrices faisant prendre l’air à ceux qui leur sont confiés et la purée de pois qui empêche les policiers d’y voir assez pour trousser quelqu’un. En fait de mythologiques, les yeux des cyclopes roux ne sont rien d’autre que la lueur des pipes. Chez Poulenc comme chez Apollinaire, la verve peut tojours le céder brusquement à la plus profonde émotion. Bleuet, le titre de la mélodie suivante, est un tendre diminutif de «bleu», terme argotique désignant un jeune soldat. Ce soldat va mourir; à cinq heures, il faut quitter les tranchées pour affronter le feu ennemi. Mais il n’y a ni héroïsme ni patriotisme exacerbés dans cette mélodie. Et Poulenc d’écrire: «L’humilité, qu’il s’agisse de la prière ou du sacrifice d’une vie, c’est ce qui me touche le plus … l’âme s’envole après un long regard jeté sur ‘la douceur d’autrefois’.» C’est l’unique mélodie de Poulenc pour ténor et elle requiert plus la voix d’un Cuenod que d’un Gigli; pour dire le jeune homme de vingt ans, le malheureux gâchis de sa vie et ce dernier long regard, la voix du narrateur doit avoir un timbre particulier, éthéré. Apollinaire rédigea ce poème en 1917, un an environ avant de mourir des suites de ses blessures de guerre. Autre adieu émouvant, Voyage fut également mis en musique dans un contexte de guerre. Qui d’autre que Poulenc eût pu déchiffrer ce Calligramme (comme Apollinaire appelait ses expérimentations de typographie picturale—et celui-ci a une mise en page particulièrement déroutante) et produire une mélodie d’une telle lucidité fluide? Le climat est ici à l’acceptation résignée—les séparations en temps de guerre sont souvent des adieux à jamais; le voyage de Dante dans les sphères infernales est sans retour. Comme dans Montparnasse, nous assistons à une réaction presque chimique quand la musique de Poulenc rencontre la poésie dite surréaliste d’Apollinaire et de Paul Éluard (1895–1952). Poulenc écrivit: «Si l’on mettait sur ma tombe: Cigît Francis Poulenc, le musicien d’Apollinaire et d’Éluard, il me semble que ce serait mon plus beau titre de gloire.» Avec son intelligence innée de leur œuvre, il illumine ces vers parfois insondables qui, par leur force et leur dignité, garantissent, en retour, à son lyrisme de ne jamais verser dans la sentimentalité. C’est comme si un merveilleux marché avait été conclu entre la tête et le cœur, entre l’usage moderne de la langue et la puissance surannée de la mélodie. Hôtel nous ramène dans le Montparnasse d’Apollinaire et de Poulenc. Au lendemain de la Première Guerre mondiale, ce quartier était celui de Picasso et de Derain, de Gris et de Modigliani. Poulenc, inlassable connaisseur et amateur de peinture, s’enflamma pour le bourdonnement avant-gardiste du Montparnasse de sa jeunesse. Mais Hôtel ne parle pas de créativité. Bien au contraire, il parle de paresse. Et là encore, Poulenc était, à en croire ses amis, un vrai maître! L’accord initial évoque la première bouffée délicieusement longue des dangereux plaisirs d’une Gitane. La musique baîlle, s’étire, et la fumée s’élève en volutes vers le plafond, au rythme d’une valse lentissime. Le chapitre Apollinaire de ce récital se clôt sur la plus ancienne mélodie poulencquienne de ce disque, les Trois Poèmes de Louise Lalanne—grâce à ce nom, Apollinaire put se faire passer pour une poétesse dans les pages de la revue littéraire Marges. Mais la paresse de Montparnasse l’emporta et, pressé par une date butoir, il fouilla dans les notes littéraires de sa maîtresse pour dénicher quelque chose de convenablement féminin. Sa tendre collaboratrice n’était autre que le peintre Marie Laurencin (1885–1956; un de ses tableaux orne la couverture de ce livret), conceptrice des costumes et des décors du premier grand succès de Poulenc, le ballet Les Biches, présenté par Diaghilev en 1924. Laurencin avait été «découverte» avec enthousiasme par Apollinaire, influent critique d’art. Dans ce corpus, seule l’ineptie éclair intitulée Chanson est de lui, Le présent (où Poulenc est influencé par l’implacable dernier mouvement de la Sonate en si bémol mineur de Chopin) et Hier étant des textes de son amie. Hier est la première mélodie pour laquelle Poulenc recourt à la veine lyrique qui marquera tant de ses meilleures chansons. Quand il la composa en 1931, ses folles années étaient derrière lui. Dans cette mélodie, le pitre et le gueux le montre capable de mélancolie, et il choisit le style d’une boîte parisienne enfumée (plane le fantôme de Marie Dubas, devancière de Piaf) pour faire sa tendre révélation. Si les chansons d’Apollinaire sont de terre et d’eau (le pavé de Paris, le murmure de la Seine), celles de Paul Éluard sont de feu et d’air. Car force est de reconnaître que Poulenc ne conçut ses plus grandes mises en musique apollinariennes qu’après être passé par le feu affineur de la poésie d’Éluard. 1936 fut une année charnière: Poulenc perdit un de ses amis, le compositeur Pierre-Octave Ferroud, dans un macabre accident; une expérience mystique au lieu saint de la Vierge noire, à Rocamadour, le poussa à se reconvertir au catholicisme; son duo scénique avec le baryton Pierre Bernac était bien établi; et, concernant sa musique vocale, Éluard s’imposa comme un collaborateur prisé. De ces expériences naquit un créateur plus grave et plus dévoué, qui avait trouvé en Bernac un interprète tout aussi grave et dévoué, à même de donner voix à ce nouveau lyrisme idéaliste. Le cycle Tel jour telle nuit compte parmi les plus grandes réalisations poulencquiennes de cette époque. Nullement découragé par de légères difficultés, le compositeur va au cœur des poèmes, où Éluard a mis ses expériences (voyages, rencontres, amitiés, rêves et, surtout, son amour pour sa femme Nusch). L’interprétation musicale de Poulenc aide à ouvrir une porte derrière laquelle Éluard, intellectuel apparemment brillant, se montre tel qu’en lui-même: un poète du peuple, prodigue chantre de l’amour, des beautés de la nature et de la fraternité humaine. La dernière mélodie de ce cycle, Nous avons fait la nuit, est l’une des plus grandes chansons d’amour de toute la musique française; le poème n’est que celui d’un homme expliquant une relation mais, illuminé par la musique de Poulenc, il revêt une portée universelle et révèle une profonde compréhension de la nature même de l’amour, mais aussi les moyens de son constant renouveau. Guère surprenant que le postlude, résumé du cycle, rappelle par sa puissance la fin d’un cycle moins optimiste mais tout aussi sincère: la Dichterliebe schumannienne. Les trois courtes chansons des Métamorphoses, d’après Vilmorin, sont du pur Poulenc et offrent un échantillon, un mini-précis de ses trois grands styles mélodiques: rapide et fantasquement lyrique (Reine des mouettes); lent (jamais très lent) et d’un lyrisme émouvant (C’est ainsi que tu es); et rapide, dans la tradition du café-concert, avec une virtuosité en moto perpetuo (Paganini). Chronologiquement, ces mélodies charmeresses, toute légères, viennent après Tel jour telle nuit, signe de la sagace adaptabilité du mélodiste Poulenc à la fin des années 1930. Colloque, sur un texte de Paul Valéry (1871–1945) demeura inédit du vivant de Poulenc. Conformément au titre, c’est un colloque où les deux voix ne chantent jamais ensemble. Valéry avait originellement intitulé ce poème (dédié à Poulenc) «Dialogues pour deux flûtes». Le compositeur avoua que, s’il admirait autant Valéry que Verlaine ou Rimbaud, il ne se sentait pas à l’aise pour mettre ses textes en musique. La ligne vocale et les harmonies sont assez gracieuses, mais il n’y a pas de véritable fusion entre les paroles et la musique. Les Deux Poèmes de Louis Aragon sont, au contraire, du parfait Poulenc. Dans C, Louis Aragon (1897–1982) voit dans la chute de la France entre les mains allemandes, en 1940, le piteux dénouement de siècles de fausses valeurs et d’un patriotisme fondé sur l’exploitation des classes. Sur le papier, les mots peuvent paraître amers et rageurs, mais Poulenc y décèle le déchirement: le poète marxiste et le compositeur châtelain (il possédait une superbe maison de campagne à Noizay, près de Tours) sont unis dans cette chanson par un même droit d’être français. Fêtes galantes est un antidote à un apitoyement par trop nationaliste. La nation qui produisit les courtisans froidement élégants des «Fêtes galantes» de Watteau, sous le règne de Louis XV, est maintenant en plein désarroi, sous l’assaut des envahisseurs nazis. L’élégance n’est plus guère de mise dans la comédie de mœurs, mais les mœurs ont beau partir en fumée, la comédie reste. La vie sous l’Occupation changea bien des choses, mais l’institution de la chanson de cabaret, chantée à plein gosier, vulgaire et poétique à la fois, ne pouvait être qu’insolemment, irrésistiblement française. Priez pour paix fut rédigée dans les sombres jours de la crise de Munich, sur un texte du duc Charles d’Orléans (1394–1465). Poulenc écrivit: «Essayé de donner ici une impression de ferveur et surtout d’humilité (pour moi la plus belle qualité de la prière). C’est une prière de sanctuaire de campagne.» Ce n’est pas qu’une musique religieuse: subtilement, elle cherche à atteindre une atmosphère médiévale hiératique, en phase avec le poète. En 1935, Poulenc retravailla la musique du compositeur seiziémiste Claude Gervais dans sa Suite française (à la fois œuvre de chambre et suite pour piano). Contemporaine, À sa guitare montre la patte d’un pasticheur raffiné. Toute cette musique fut, en réalité, écrite pour Margot, une pièce de théâtre d’Édouard Bourdet sur Marguerite de Valois, même si Poulenc choisit de mettre en musique des vers de Pierre de Ronsard (1524–1585). Cette mélodie fut créée par la célèbre actrice et chanteuse Yvonne Printemps. L’orchestration, qu’on peut entendre sur le fameux disque de cette dernière, a depuis été perdue. Les trois dernières mélodies de notre enregistrement montrent une facette plus légère du compositeur. Toréador (paroles de Jean Cocteau, 1889–1963) est la seule mélodie que, de l’aveu de ses contemporains, Poulenc, vocalement peu doué, chantait mieux (et d’une manière plus nasale) que quiconque. C’est un fatras d’absurdités hispano-vénitiennes puissamment évocateur du music-hall. Et c’est le genre de musique tonitruante que Poulenc (inspiré par Maurice Chevalier) pouvait improviser au mètre, dans son adolescence; de ce matériau brut, il tirera une évocation plus subtile dans les mélodies de sa maturité. Nous voulons une petite sœur est une aria parlante avec peu de substance musicale mais un charme immense. Celle qui parvient à résister aux pièges de prononciation de la liste de Noël de Madame Eustache mérite un prix de diction et que les enfants importuns marquent une pause dans leurs exigences. Les chemins de l’amour, également interprétée par Yvonne Printemps, fut écrite pour Léocadia de Jean Anouilh (1910–1987). Elle nous donne à voir combien Poulenc aurait pu écrire des «hits» ou des musiques de film, comme son collègue Georges Auric. Cette valse est toujours fort chantée dans les récitals et on en abuse comme bis, pour gagner des applaudissements. Après tout, España n’est pas le meilleur de Chabrier, ni le Boléro le meilleur de Ravel, même si tous deux sont, à leur manière, des chefs-d’œuvre. Poulenc devait envisager cette charmante bagatelle comme un petit-four, à servir uniquement après un copieux repas de ses grandes mélodies. Mais, tous les gourmets et les passionnés de chansons le savent, quand il vient à point, un excellent petit-four est irrésistible.